Film historian Maureen Lee Lenker returns with the latest edition of her column, Dame in the Game: an in-depth look at groundbreaking women in film. While the names DeMille and Griffith are known today as the “fathers of American cinema,” Weber and her efforts are obscured, despite the fact that she was a triple threat: writing, acting, and directing films. Until recently, nearly every history of Universal Pictures ignored the contributions of Weber despite the fact that she was co-head of the Rex brand there; the highest-paid director of the 1910s; and head of the story department in the transitional era of the 1920s. 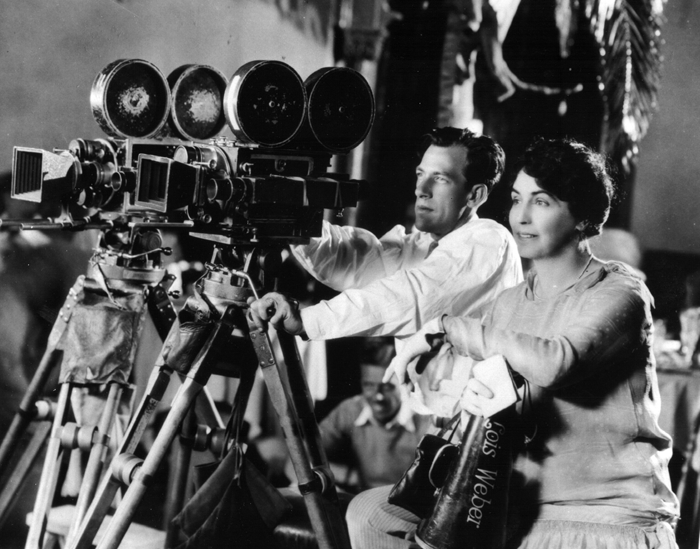 Weber was edged out of the industry as filmmaking became a monetary pursuit dominated by men. Indeed, she credited her success to the fledgling nature of the industry, saying, “I grew up in the business when everybody was so busy learning their particular branch of the new industry that no one had time to notice whether or not a woman was gaining a foothold.” While some of the women Dame in the Game has featured have been well-known stars, here we seek to unearth the lost contributions of Lois Weber, a true force of nature in cinema history. Born in 1879, Weber began her career at the Gaumont Chronophone Company in 1908, directing, acting in, and writing films. Here, she became the second individual (after Alice Guy Blaché) to direct a sound motion picture with early sound-on-disc films. She and her husband Phillips Smalley then moved to the Reliance Motion Picture Company in 1910 and became the resident directors and leading players of the Rex Company, founded by Edwin S. Porter. At the Rex Company, Weber turned out a script a week, and by 1914, after only six years in the business, she estimated she’d completed over two hundred pictures. 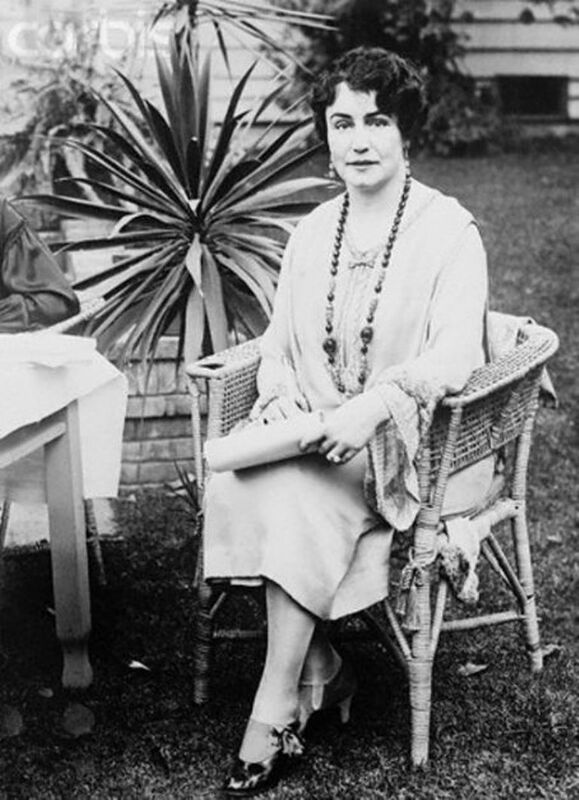 Before gaining acclaim as a director, her skills as a screenwriter were already earning her recognition, being hailed as “one of the most gifted scenario writers in the field.” In 1914, Moving Picture World noted “Something substantial is always to be expected from the pen of Lois Weber.” Though she spanned the gamut in her cinematic work, Weber often painted her occupation as that of a writer and drew most heavily upon that aspect of her work. She helped lead the charge to professionalize screenwriting and was a founding member of the Photoplay Authors’ League in 1914, alongside the likes of Anita Loos and D.W. Griffith. In 1912, the Rex Company became a subsidiary of Universal pictures and owner Carl Laemmle so respected Weber’s work that she became a production head, answerable only to him as his “best man” on the lot. At Universal, Weber oversaw every aspect of her filmmaking from writing to directing to editing, and even frequently acting in films. She expanded to the political sphere at Universal, running for Mayor of Universal City in 1913 (on an all-female, suffragist ticket!). Her scripts for shorts at Rex focused on female protagonists and often centered on women leading unconventional lives, roles she often played herself. Continuing her interest in strong central female characters, she became the first woman to direct a feature film with a 1914 adaptation of Shakespeare’s The Merchant of Venice. For about a year, Weber left Universal to make films for Bosworth, Inc. where she delved more deeply into into provocative themes like the need to “perform” gender, shifting more fully towards contemporary social issues and realism in her storytelling. She also began to exhibit innovative camerawork as a director, as when she opened Sunshine Molly with a 360-degree tilt & panning shot and used a miniature to effectively film an explosive conclusion to the film. The film explored sexual harassment and sexual violence in the workplace, breaking barriers from both a technical and storytelling standpoint. While at Bosworth, Weber also mentored screenwriter Frances Marion, hiring her as an assistant and an actress and launching her on her own formidable career trajectory. Weber returned to Universal in the spring of 1915, and by this time had so firmly established her identity in the industry that one writer declared, “There is no man in the industry who is a greater writer than this woman at Universal City.” Her directing career was also gaining traction, and she grabbed headlines with her 1916 film Where Are My Children? which tackled hot button issues of birth control and abortion just as Margaret Sanger’s campaign for contraception was reaching its zenith. Universal Weekly declared her the “Greatest Woman Director in the World,” and she earned a place as the first and only woman in the Motion Picture Director’s Association. Weber stressed the role of the director as a creative one and advocated for directorial authority over everything from shooting to cutting to titling. She believed that female directors brought something new and valuable to cinema, saying “I like to direct because I believe a woman, more or less intuitively, brings out many of the emotions that are rarely expressed on the screen.” With their attention to detail and more emotional outlook, Weber actually used gender stereotypes to argue that women were better directors than men. She used her power to mentor other female artists on the lot and advocate for the importance of women’s point of view in the industry. Many performers in her films, including Elsie Jane Wilson and Cleo Madison, went on to direct, and screenwriter Jeanie Macpherson got her start acting in Weber projects Indeed, her reach expanded beyond mentoring women — great American directors Henry Hathaway and John Ford started as prop boys on her set. 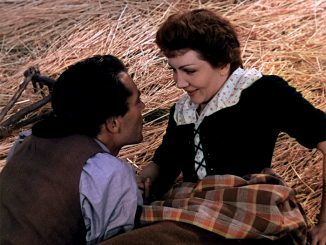 Though Ford never credited her, Hathaway always took care to stress the debt he owed to Weber and what he learned from her. Her films ambitiously tackled social issues as wide ranging as drug addiction, poverty, contraception, and capital punishment, as she forwarded her beliefs in an “activist cinema” that didn’t merely entertain viewers, but pushed them to engage with social and political concerns. She also wasn’t afraid to dive into murkier issues such as morality and guilt. Weber wanted her films to be “the editorial page of the Universal Company” and deliver complex problems to audiences the way a newspaper would — time and again, she asserted the rights of filmmakers and cinema to participate in national debates. She stood for a Progressive mode of filmmaking that was antithetical to the work of many other filmmakers. Her film, The People Vs. John Doe, was not only a propaganda film against capital punishment, but it featured a lead female character at the front of the battle for social justice. Similarly, Shoes implored viewers to endorse women’s wage equity (albeit by relying on traditional notions of sexual purity). The Hand That Rocks the Cradle, a film Weber believed so strongly in that she returned to acting to play the lead role, tells the tale of a woman indicted for advocating for birth control. 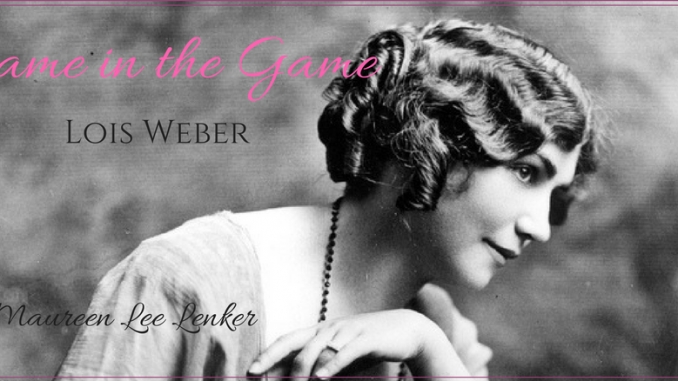 In 1917, Weber took her career to new heights, signing a lucrative distribution deal and forming her own independent company, Lois Weber Productions, complete with its own studio on Santa Monica Boulevard in Hollywood. The company released fourteen feature films in its four years of existence. 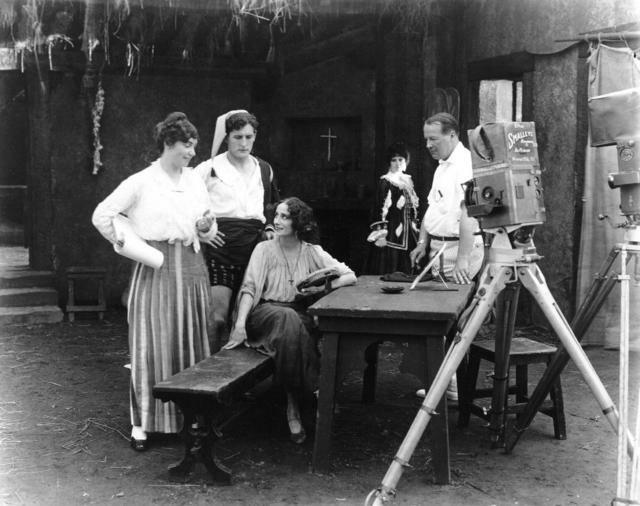 At Lois Weber Productions, she pledged to make “little teas,” films focusing on domestic relationships and marriage, which were well-suited to the limited space at her small studio lot. Weber was one of the first to conceive of marital, familial, and domestic strife as related to larger social concerns, such as class mobility and capitalism. Space limitations also led her to invest in location shooting, which lent her films a greater degree of realism. Though she had promised lighter films under her production company, she still used her platform to critique marriage, sexuality, and more. In 1919, she worked out a new production distribution deal with Paramount that earned her above $500,000 a year and enabled her to buy the studio facilities she was leasing. At this time, Weber also became known as a “star maker,” developing actresses into major talents. She’d done this for Mildred Harris, whose notoriety as Charlie Chaplin’s young bride quickly overwhelmed her acting talents. Reportedly, Weber discovered actress Claire Windsor in the Paramount cafeteria and negotiated a contract where she had exclusive rights to her talents for one year. Weber discovered talent and built them into stars or helped redefine the careers of already established stars like Billy Dove. Actresses loved working with her, citing her deep understanding of women. 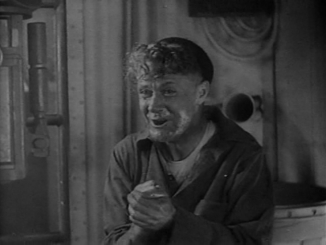 Weber wrote characters that offered roles with greater complexity, while also actively critiquing Hollywood’s glamour industry. After taking a breather from movie-making (amidst a divorce and bouts of depression), Weber returned to Universal in 1925 where Carl Laemmle appointed her as head of a new production department focused on developing novels for the screen. She also continued to direct throughout the 1920s, commenting on changing modes of femininity in her work, and critiquing flapper culture, saying “The modern girl does not demand jazz parties, cocktails and late hours nearly as much as she demands freedom of thought and action.” To Weber, the modern woman was one who was intelligent and socially engaged, as she was in her films. She was the only female director to become a member of the Academy of Motion Pictures Arts and Sciences when it was founded in 1927, and she took an active role, helping to draft a standard contract for freelance directors and serving on numerous committees. Weber continued to work as a filmmaker, but more importantly, she spoke out for filmmaking as an art and promoted female filmmakers in an industry she saw turning increasingly exclusive. In 1933, Weber was offered the first chance to direct in six years, and she seized it to turn out a picture that tackled interracial relationships and was the first film to shoot on location on the Hawaiian island of Kauai. Continuing her record of progressive filmmaking, Weber made a woman of color the protagonist. As she found herself shut out of filmmaking with the rise of sound and the monopoly of the studio system, Weber sought other outlets, promoting film as an educational tool and advocating for a system of visual education in school. She believed that ideas could be better absorbed from motion picture screens than books. Developing a complete visual school curriculum, she shopped it to school boards around the country with assistance from Carl Laemmle. Her aim was to replace the “blackboard with the screen.” She believed that children from disadvantaged backgrounds and immigrant families could benefit from the universal language of cinema. From the time she entered the business in 1908 to her death in 1939, Weber never stopped fighting tirelessly to carve a meaningful place for herself as an artist and auteur in the world. She believed firmly in cinema as a force for social change and meaningful dialogue. A trailblazer and a game-changer, Weber is the epitome of those Dame in the Game wishes to exhume from the pages of history and restore to their rightful place. Fantastic article! As a film aficionado I am both delighted and ashamed only now discovering such an important figure in film and women’s rights history. Thank you!